I’ve been inspired by another writer friend, whose work I absolutely adore, to write about what the creative process means to me. Also, this gets quite long. I write a lot about writing, and the positive benefits to my mental health when I write, but I recently realised that I haven’t spoken much about where my ideas come from, where they take me and why writing for mental health is so important to me. I carry my thoughts with me for a long time before I commit them to paper, or laptop. At any one time, I can be thinking about, and working on, one, two or even seventeen different creative pieces. Mostly these ideas are just snippets of inspiration that have come to me, a single line or an interesting image. They can be a reflection of something I have felt or seen that day, a reaction to a situation or an emotional stimulus. Sometimes they come from moments of active observation: people, nature, or current affairs. Other times they might come to me completely randomly, like when you wake up with a song in your head. What I realise now is how my behaviour and approach to writing has increased the frequency of these sparks arriving. I tend to see inspiration as a snapshot, a single, fleeting image that quite often arrives without warning and can leave just as quickly if not captured. I call these ideas Thought Butterflies. Almost every time an idea will start with a line that just appears out of nowhere. It grows and swells, and entwines itself all around inside me until I am able to give it my full attention. I imagine the Thought Butterflies lifting, soaring and landing upon me, leaving little pieces of inspiration in their wake; and I can be inspired by anything! A twisted piece of driftwood which looks strangely like the shape of a horse; a song lyric heard on the radio in a shop; a doll in the window of a neighbour’s house; the daisies on the lawn I keep meaning to get rid of. I take hundred of pictures on my ‘phone of things I see and places I go, and I know at least one of them will ignite a spark, sometimes days, months or even years later. The more attention I give the Thought Butterflies and stay creatively active, the more inspiration and I fulfilment I receive through my writing. This is, however, quite a new experience for me. I finished my first and only novel in 2016, but have hardly touched it since. I haven’t even contemplated the editing process, which it so desperately needs. I wrote it to prove to myself that I could, that I was capable of committing over 80,000 words to a project, but when I look back at it now, it needs a lot of polishing and in fact, I have accepted that I will probably scrap most of it and rewrite it. That does not mean it is all bad, I still think it has good bones. It was something that, at the time, needed to be done. I was struggling with my emotional and physical health, unhappy with where I was living and the direction my life was taking. A random meeting with an author who I had admired for many years gave me the inspiration, and the metaphorical kick up the backside, to sit down and write again. Not only that, to actually finish a project. It gave me a focus and drive, and even though I doubted myself and any talent I might have, it was addictive and brilliant fun. I lost myself in that novel, and as a consequence, I found myself too. Then life moved on again and took me down many different paths, and my writing routine was changed once more. It always amazes me how many of my friends have said to me, “oh, I used to write, but I don’t have the time now,” and I fully understand what they mean by that, because just over seven months ago I was exactly the same. I didn’t give any time to writing. I ignored my brief creative urges in favour of passive entertainment or, perhaps even worse, household chores. Less than a year before that, my family and I moved 12,000 miles to the other side of the world, and rather than use that amazing experience as inspiration, I completely shut down. It was, altogether, Too Much. I suspect that one of the hardest parts of being an ex-pat or immigrant, or however you wish to label it, is not feeling like you are allowed to talk about how hard it is. There is an underlying feeling that everything that happens, good and bad, is entirely because of your own choices. The understanding that “you made your own bed, now lie in it.” You are torn between wanting and needing help and support, and feeling like you also have to prove to everyone how tough you are, how capable. There are a lot of ups and downs and tests of your emotional stamina, not to mention a whole lot of firsts to discover. I had to focus on what was in front of me before I could give any of my energy elsewhere. In January my husband bought me the most beautiful notebook. 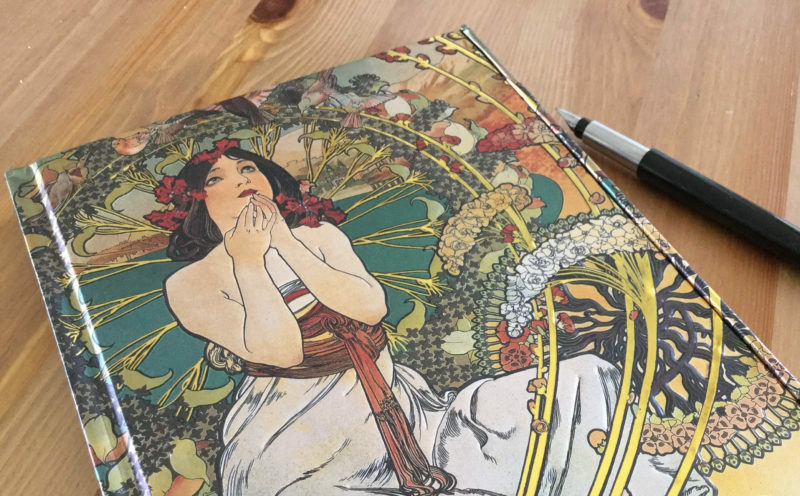 Gold and red, embossed with an image by Alphonse Mucha – one of my favourite artists. It was almost too beautiful. I couldn’t bring myself to write anything in it until the end of April, I was so worried that I would ruin it in some way. Eventually, I woke up one morning and simply decided the time was right. I couldn’t even say what prompted this feeling, other than it was a particularly sunny and joyous morning, and as I sat with my first cup of coffee looking out at the intensely blue sea from the back window of our house, feeling so incredibly lucky, I felt moved to write something. It was the start of something, an awakening I had been waiting for without knowing it. Like a deep breathe I had been holding in, without realising that I had been doing so, and now I could finally exhale. People talk about the floodgates opening, about ideas tumbling and surging when the creative block is finally lifted, and it absolutely was like that. I refer to it as “curing my creative constipation”, not a unique description I know, but it was as if that simple act of finally putting something onto paper began to flush all the emotional crap out of my system. I felt the beginnings of rejuvenation, of the enjoyment in being inspired. And then a good friend passed away. I was floored. They had lived in the UK, and I was in New Zealand. I couldn’t be there or do anything physically, so I tried my best to connect with people online but it wasn’t the same. I felt so sad and so angry and I missed her so much. At the same time my health was worrying me, and the health of my eldest child was worrying me. I missed my family and my old friends, and I felt like people were abandoning me because I was no longer present with them. The time-zone difference made communicating hard. I didn’t have the same support systems I had back in the U.K., and only a few New Zealand friends I could discuss how I really felt with. One supposed friend abandoned me without warning. It was winter, and I hated how cold I always felt and how damp our house was. I could see I was losing my connection with my best friend in the U.K. due to distance, but I struggled to talk to them because they had so many of their own problems which were taking up their time. I made mistakes, I put my trust in the wrong people, I forgot about being honest with myself about who I was. I stopped writing joyously and started writing through sadness. The stereotype of the “tortured artist” is well known and well spoken of, and many of the most wonderful poets and authors have written about loss and grief and trouble times. It is an essential part of human nature to experience both good and bad emotions, but, for me, writing about feeling sad is not fulfilling. It does not nurture me, nor offer me escape, it merely compounds my sadness and makes me focus on the terrible, without acknowledging the good. I forget about the many positive things that still surround me, regardless of how big or small they may be. Depression and anxiety are not new to me, I have experienced both since my teens. I understand the shame and stigma some feel at admitting this, why it is frequently portrayed as being weak or bad, and I actively try to challenge and change this way of thinking through talking about and writing about mental health, to help others overcome their fears. For me it is just another ailment no different from my deafness and Diabetes. It is a part of me but it does not define me. I sometimes have to recognise it and give it a bit more of my time, but I also know it will never beat me, because it never has yet. My depression has cost me relationships in the past, with others no doubt seeing me as unstable or difficult. Now I have become marvellously adept at hiding my very darkest periods from anyone other than my closest family, I also recognise that I have cycles which ebb and flow and as long as I keep myself safe it will pass. My writing between June and September is very, very bleak. It shows the desperation I was feeling, and the losses I had experienced. How everything compounded into a massive ball of Too Much which I did not feel equipped to cope with. It shows very clearly the unique ways that depression and anxiety affect your mind and twist your thoughts, and convince you that the darkness is all that you deserve. Yet I was still writing. As horrible and as sad and as empty as I felt, something, some little part of me or the energy of the universe, was still encouraging me, leading me, allowing me an outlet to get those feelings out. I wasn’t writing things to share at that time, they were thoughts for myself not for others. I immersed myself completely in how I felt, I let the darkness in and danced with it, yet I found as more time passed I began to speak more kindly to myself. By September I was writing every day, sometimes just a few lines, other times I would start drafting short stories. I entered a writing competition. I resurrected my old writing blog. I realised that a Facebook group that I had created not long after arriving in New Zealand could be put to better use as a support group for writers, using writing as a tool to encourage better mental health for women. My writing became less dark and more hopeful. I focused less on loss and more on new beginnings, about embracing and celebrating all of life. I remembered all the wonderful, creative and fearless things my friend used to do, and vowed to do more of those things myself. At the end of September I decided to create another Facebook page, this time just for my own creative ventures, a place where I could share my written and artistic works. I think at first I was hoping for more feedback, more interaction between artist and audience, but as time went on I realised I didn’t need that feedback as much as I thought I did. It became obvious that I was still writing very much for my own enjoyment and peace, that the opinions of others – praise or criticisms – were irrelevant. A lot of writers worry that they aren’t “good enough”, that they should leave the creating to those who have more talent or skill, but I believe that’s complete rubbish. If you want to write or create, do it. If you feel the calling to make something new, just have a go. Admittedly, there are a lot of courses and classes you can immerse yourself in and learn the nuts and bolts of writing, but I truly believe that anyone can write if they simply allow themselves the opportunity to. A writer friend of mine often speaks of listening, of giving yourself the permission to write, and she is absolutely right. The ideas are there, and the ability, you just need to find the right environment to coax them out. Do not concern yourself with how “good” or “bad” they may be. After all, art is subjective, what one person finds exquisite, another may abhor. The most important thing for me when writing is to write every day. Every single day. Without fail, without excuses, without trying to make things perfect and complete, but just filling the space with my thoughts. My creativity is a muscle which I need to flex and exercise. If I don’t use it for a while, it doesn’t disappear completely, but it definitely becomes impaired. My thoughts come slower, my writing feels more difficult, I’ll be more inclined to give up and leave things unfinished. If I write every day, even if I consider the standard of my writing to be very poor, at least I’ve provided my brain with a workout. This mental workout is also very important to me from a medical perspective, as I am concerned about the possibility of suffering from Alzheimer’s as I age. I fall into an “at risk” group, and multiple scientific studies suggest that doing something to keep your brain active is just as important, possibly even more so, as keeping your body fit. It is also one of the reasons why I wholeheartedly enjoy learning; developing new skills and challenging myself through unfamiliar experiences. The second most important thing for me is “progress not perfection.” It is a mantra I was made aware of by my husband, and finally, after many, many years of trying, I understand it. It is surprisingly easy to fall into the trap of believing that if your work is not as good as you want it to be, it must be pointless, and rather than try to improve it, you abandon it. My notebooks, phone and laptop are filled with unfinished pieces – one thing I never, ever do is delete anything I’ve written – and it could be depressing to realise just how much time I have “wasted” on these fragmented ideas, but of course, nothing that brings you joy or motivates you in some way is a poor use of your time. I have found myself revisiting some of these older works and stealing lines or characters from them, weaving them into something new. Now I always make sure I finish something, even if finished does not always mean complete. I often revisit recent poems and restructure them, or rewrite them from a different perspective. Lines I have scribbled down intended for one thing might end up somewhere completely different. They might merge together and form new verses, or perhaps they might simply serve as a stepping stone, a jumping off point from where I can ride the river of thought and see where it takes me. Now mental health forms a large part of my inspiration. I write about it, draw and paint about it, and talk openly about it. On days when I am emotionally exhausted and demotivated, I might only manage a few lines of writing, short shower-thoughts or in-the-car ideas. On heavy, black days I write of the darkness; spitting out harsh, sharp, bitter thoughts, born from a place of emotional hurt. Sometimes, when I can feel things changing, I focus on the good and the positive and being grateful. I can manipulate my emotions in this way, turn the metaphorical wheel and steer away from any negativity for a while. Writing for mental health is not the same as writing about mental health. Granted, it can be, and sometimes exploring the darker or more complex side of your emotions is an important and useful strategy in establishing a positive mental space, but I think it is simpler than that. Writing for the pure enjoyment of writing, brings focus. Pouring a part of yourself into something you create is both liberating and invigorating. It allows you to take time to explore your thoughts and emotions in the way you need to. It gives you connections and opens new doors. You just have to let yourself Open. Being Open for me, initially, was raw. I had to peel back a layer of myself, to expose and explore what was underneath. It took time for me to be honest with myself about what I wanted to say. There were thoughts I wanted to share but didn’t know how and I had built up many, many protective layers over time. I tried to go too deep too quick and realised that I needed to take a step back and just write as I breathed – slowly, calmly, and without even really thinking about it. Once I allowed myself to Open, the words came more easily, and it felt natural and peaceful. Being Open gave me the time to be more grateful, to appreciate everything I had accomplished and achieved. I made me thankful of the opportunities I had been given and the unique experiences I had lived through. Being Open did not mean that the darkness wasn’t there any more, or that everything was suddenly all positivity and joy, but it meant that I was more able to shift my focus, to see beyond the immediate situation and seek out ways I could learn or grow from each experience. Feelings did not consume me in the ways they had before. More than anything, it improved my writing immeasurably. My writing group, Well-Written, is a safe space aimed at helping women in Wellington to support each other, to guide them towards the creative tools they might benefit from to heal or grow. One in six New Zealand adults have been diagnosed with a common mental disorder at some time in their lives. This includes depression, bipolar disorders and anxiety disorders. The statistics are even higher for women, and while women may be more willing to seek treatment and to talk openly about their experiences, these numbers show no signs of getting better. I want my writing, and that of others in the community, to be part of a powerful driving force that helps things improve. A way of recognising how we can use our creativity to overcome the things that hold us back or prevent us from being our best selves. It sounds terribly melodramatic to say that writing saved my life, but it did, and it continues to do so every single day. It presents to me a unique pathway to find different ways of understanding and accepting how I feel. I do not doubt myself or my ability any more. There are no “rules” of perfect writing, or if there are, I don’t follow them. I can write to feel good; to explore my feelings and reflect on my emotions; to remember people, places and things I have done; to exorcise any negative thoughts; or simply to grow, bloom and be thankful. Now I am Open I understand that becoming a writer begins with a simple but important belief: You are already a writer; you just need to write.